For his eighth solo album Graham Coxon, Blur veteran and one of the very best guitar players around, pulls off a remarkable stunt. 'A+E' is an album brimming with vitality and creative energy that absolutely none of his contemporaries, and very few who’ve come since, can match. First off, I like the fact that after his post-folk exploration of 'The Spinning Top' he’s gone way back to his roots and the uncompromisingly experimental approach of the very fine 'Crow Sit On Blood Tree', rather than the more recent – and noticeably more commercially successful – Pop song driven style of 'Happiness In Magazines'. So it’s angular riffs, heavy beats and atonal drone washed over with upbeat vocals, low in the mix and giving an outsiders view on the practical aspects of, mostly London, life. It’s remarkably and unpredictably catchy. 'Advice' kicks off with guitar adventures and disjointed bass, and a London twang to the vocals that treads a fine line but stays just on the right side of Rockney. Although it must be said that 'Running For Your Life' does sound a bit like Jimmy Hendrix guesting on a Chas and Dave reunion album. Aside from 'Running For Your Life', Mr Coxon really doesn’t put a foot wrong with extended work outs like 'City Hall' that take synths, guitars and layered sounds to spin a dark musical tale - almost Brechtian. 'What’ll It Take' has danceable beats and 'Meet+Drink+Pollinate' creates an 80’s resonance with heavy synthesiser and repetitive chanted lyrics; next up 'The Truth' is even heavier. All in all, it has a slightly menacing quality and could be a soundtrack to 'The Only Way Is Essex' reinvented as an acid trip. 'Seven Naked Valleys' is a return to some sort of normality, and with its wailing guitars and chugging riffs is my favourite track on the record. 'Running For Your Life' isn’t quite as bad as I may have led you to believe and the album ends strongly with guitar textures driving 'Bah Singer' and 'Knife In The Cast'. Graham Coxon certainly knows how to make a distinctive noise and he knows how to turn his noises into a song, but best of all he communicates an urgency and a passion about his creative process. When most of his peers have settled for the slippers and cocoa, he’s out roaming the frontiers and still making living, breathing music. 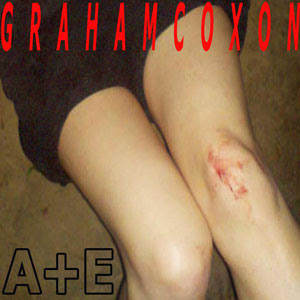 'A+E' is available to purchase at amazon.co.uk. More info at grahamcoxon.co.uk.